Fixed font rendering size on high DPI screens. Fixed a bug where a recipe might get duplicated when changing its rating from the grid view. Hi folks. I am pleased to announce a major upgrade to Paprika’s web browser that we have been working on for quite some time. To make it easier to save recipes from your favorite sites, we have built a natural language processing engine into Paprika that can automatically recognize any recipe written in plain English on any website. 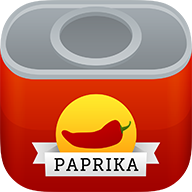 This means that you no longer have to request support for specific sites to be added to Paprika, nor will you need to resort to Paprika's clipboard tools to copy and paste the recipe from the browser when you encounter an unsupported site. Just press Save Recipe and Paprika will figure out the rest. Fixed problems with activations being lost after system upgrades or hardware changes. Added margins to prevent text from being cut off when printing grocery lists and meal plans. Fixed a problem that could cause the application to deactivate incorrectly. Fixed a problem where adding a new menu would sometimes edit the existing menu instead. Fixed an issue with emailing recipes under certain email configurations. Fixed a few lauch issues. Fixed a few minor bugs in the YAML importer. Correctly refresh the recipe list when the search type is changed. Nutritional information is now imported from Living Cookbook files. Slightly darkened the color of the recipe text. Added a setting to disable browser plugins to prevent Flash from crashing the browser. Fixed a browser issue that might cause the app not to launch properly. Added missing Spices and Seasonings aisle. Added more informative error messages if the app has problems launching. Improved performance when syncing large databases. Fixed several crashes when using the browser and viewing recipes. Applied font size setting to ingredients, directions, nutrition, and notes when editing recipes. Fixed sorting of recipes by prep time or cook time. Enabled auto-detection of proxy settings for the browser. Improved behavior of browser back and forward buttons. Import rating and reviews from Living Cookbook files. Fixed ingredient importing from certain MasterCook files. Added more informative error messages if the app initialization fails.